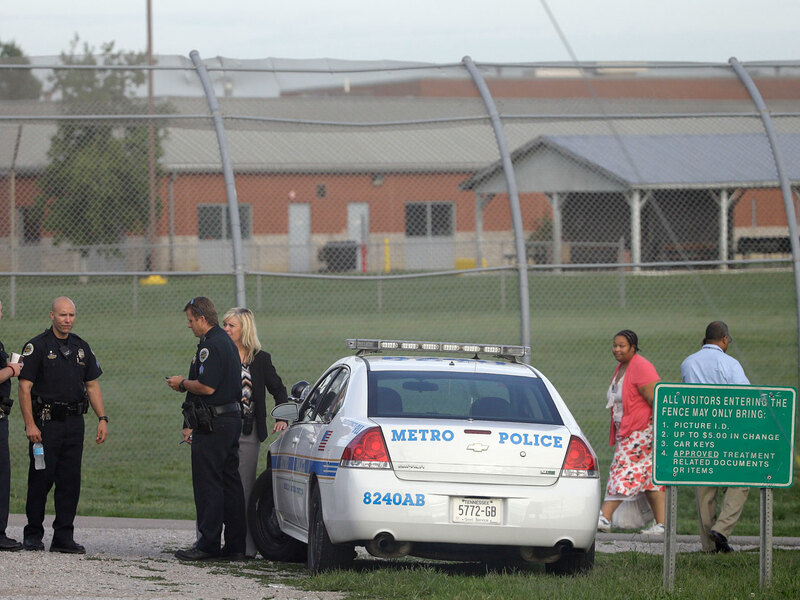 NASHVILLE, Tenn. - Thirty-two teens escaped from a Nashville youth detention center by crawling under a weak spot in a fence late Monday, and seven were still at large Tuesday, a spokesman said. The teens - ages 14 to 19 - left their rooms at about 11 p.m. Monday night and "overwhelmed" the staff in a common area, Tennessee Department of Children's Services spokesman Rob Johnson said. "Staffing was lighter during the overnight hours, so presumably they had planned for that." The group then kicked out a metal panel under a window to get into a yard, and ran for a chain-link fence. The fence is buried 8 inches deep into the ground, but the teens managed to pull up a weak portion and slip out underneath it. Staff alerted police once they saw them escaping, he said. However, Don Aaron from the Metropolitan Nashville Police Department told CBS affiliate WTVF-TV in Nashville that Woodland Hills waited an hour and a half before calling police. Investigators were working to determine why there was a delay. Once police were notified, they quickly set up a containment perimeter and began searching. The teens were wearing grey shirts, dark dungaree-style pants and black shoes. Two were captured immediately and others were found overnight. Some were found by authorities, others turned themselves in, and still others were turned in by their families, he said. None of the 16 to 18 staff members on duty were hurt, officials said. Police and the Tennessee Highway Patrol were still searching for nine of the teens on Tuesday, while the other 23 were taken to juvenile court and could face escape charges, officials said. Most of the 78 detainees at the state-owned Woodland Hills Youth Development Center Monday night had committed at least three felonies, Johnson said, but the facility is more like a high school with security than an adult prison. There are no guard towers or barbed wire. The teens stay in single rooms that for their own security are locked on the outside, so that only those with keys can enter. But the teens can push their room doors open if they need to. They wear blue pants with white or light gray T-shirts, with no markings. The center has a school, offers vocational training and career counseling, and works to move teens to less restrictive settings, according to a state website. It holds teens until their 19th birthdays, and all have been charged as juveniles, not adults. Their records are sealed. Woodland Hills has 191 staff positions, but 28 of them are vacant, and during sleeping hours, there is only 1 staffer for every 16 students, the state website said. The fence was fixed and the detention center was calm and back under control Tuesday morning, Johnson said. Police cars were on the scene, but there was little activity at the center or its neighbors - a women's prison, several trucking company offices, a frozen pizza plant and a liquor distributor.